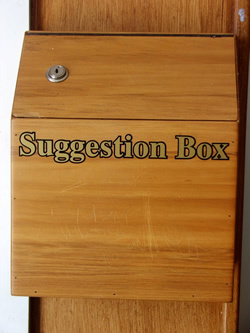 With most businesses scrambling to trim expenses, cut down on utility costs, or improve customer service, the product/service, or production in general, the use of a suggestion box could offer fresh insight, innovative thinking, and impressive cost saving measures. Many businesses do indeed have a suggestion box. However, only 3% of U.S. companies have successful suggestion programs. While many businesses are turning to the managers or senior level employees for suggestions, the employees who live and work in the field are often overlooked. Often times, one who directly deals with production can offer ideas that a senior employee would never have even considered. However, in order to receive any beneficial feedback in the suggestion box, a few things must be considered. First off, the dirty cardboard box does not offer an appealing appearance. Constructed haphazardly, it seems to imply that the suggestions are not really that important. Relatively cheap, a customized suggestion box can be purchased online for around $40. You can even purchase one that locks, holds comment paper and pens, and is wall mountable or sits on a flat surface. Secondly, you must choose the location of your suggestion box very wisely. Consider placing it near the entrance or time clock. As employees enter or exit, they can quickly drop their suggestions off. If you have two main entrances, consider purchasing two suggestion boxes. Now that you have installed the box, you just wait for the suggestions to pour in. Right? Well, not exactly. The most effectively implemented suggestion boxes are promoted internally. Hold a brief company meeting and explain the new addition. Consider offering a financial reward, such as 10% of the savings their change has enacted. Or, consider offering a gas card, gift card, restaurant voucher, movie tickets, etc. for small changes. You could also make the suggestion box competitive. Offer a special reward to the employee who introduced the largest saving. Have the employee put their name and date on the suggestion. This ensures that proper recognition and credit will be given in a timely manner. Don’t encourage anonymous suggestions. If you are going to make the suggestion, stand behind it and be proud of it. Along with the suggestion, have the employee explain how it will save money, time, materials, etc. Be sure to emphasize that the idea here is not quantity, but rather quality. One well-thought out idea could save thousands. Each time a new idea is accepted, give recognition on the bulletin board. The employees will quickly see that their ideas and opinions do matter. If an idea is not implemented, take a few moments to explain why to the employee. However, be sure to encourage their future input, as their suggestion brings up important views. A suggestion box can have significant benefits on a company. Consider American Airlines, one of that 3% statistic, who created “IdeaAAs in Flight” which receives an estimated $55 million in suggestions each year. A properly designed, well-executed system that encourages and motivates employees to offer their input can reap such benefits.